Giveaway for 6 wonderfully amusing children’s books! Congratulations to Samantha, winner of this giveaway for 6 children’s books! It’s time for another giveaway for 6 delightful children’s books! I love being able to offer these giveaways in the hope that the books received will encourage parents to read to their children. It is one of the greatest gifts that you can give them. Reading builds vocabulary and social skills in our children and opens up new worlds where their imaginations can soar! I’m very happy to say that this giveaway contains two books to honor fathers and with Fathers Day fast approaching what better timing! 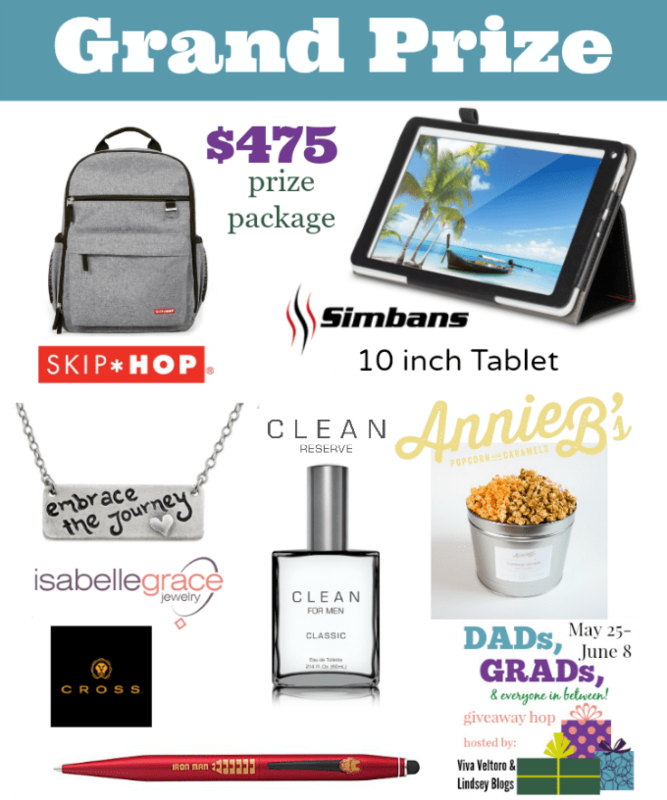 Aging Like a Fine Wine is participating in the Dads, Grads, & Everyone in Between Giveaway Hop, hosted by Lindsey Blogs and Viva Veltoro! This is the perfect book to honor Dads and all they do for Father’s Day. Lucas goes to school to learn to read and write, but he decides his Dad must have went to Dad School to learn all of the wonderful things that he does for Lucas! Things like fixing boo-boos, repairing leaky faucets, teaching him how to ride his bike and being the most important thing of all, Lucas’ Dad! A young boy thinks that his Dad is the coolest of all Dads and after thinking about it he decides it must be his Dad’s beard that enables him to be the fastest, strongest and awesomest Dad! So of course he wants a beard so he can be like his Dad. When he sees an ad for a hair growth product called “Beard in a Box”, he must have it. It finally arrives and he follows all of the directions. Then he waits, and waits and waits some more until…..
My grandchildren love this book and yours will too! All the little boy wants is a simple bowl of soup. The waiter brings bowl after bowl, but each bowl of soup holds a different zoo animal and they just keep getting bigger! This is the sequel to the beloved “Caps for Sale” and picks up right where it ends. As the peddler heads home with his hats he has no idea the monkeys are right behind him. When he discovers them in his own backyard, the silly behavior starts all over again. But this time, will the outcome be especially good? This is the classic retelling of Rudyard Kipling’s much loved story of Mowgli and all of his jungle friends. Mowgli was raised by a wolf pack in the jungle and has made many other jungle friends including Baloo the bear and Bagheera the panther. When Shere Khan the tiger sets his sites on Mowgli, his jungle friends know it’s time for him to return to his own people. Written by Adam Lehrhaupt and illustrated by Shahar Kober. Zoey isn’t like the other chickens! She dreams of big adventures! Zoey’s adventure today is a trip to space and who is she taking along? Her best friend, Sam the pig! Sam follows Zoey on her adventure, but he keeps reminding her that all he really wants is a piece of pie! The book reinforces that our imagination can take us anywhere! 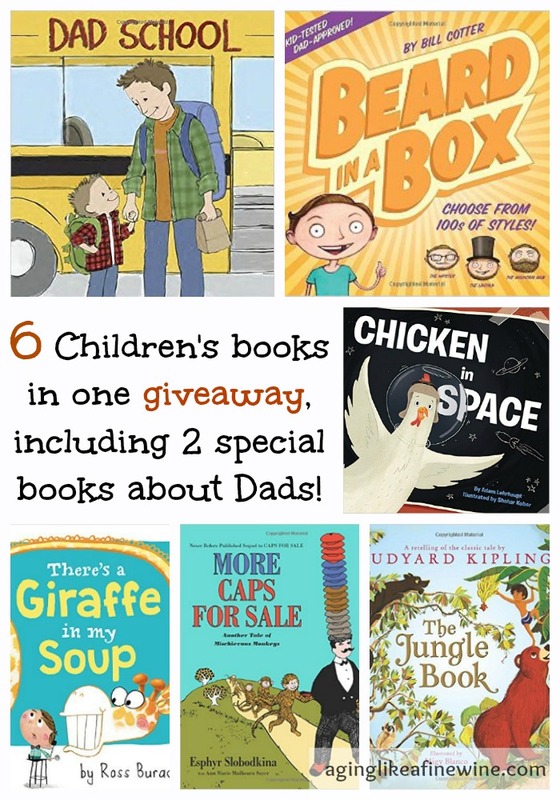 June is the month for Dads and Grads and this giveaway will provide adventurous and humerous books for Dad to share with his children along with two books that will help Dad to feel like the very important person he is! This post will be shared on the link parties found on my “Where I Party” page!! The Jungle Book!! One of my favorites from childhood!! Such a good story! I’ve always loved the animated Disney movie too. I’m looking most forward to The Jungle Book! My grandsons would love it! The Jungle Book is such a classic and loved by so many! I look forward to reading Chicken In Space. It’s cute. I recently read it to my grandkids and they enjoyed it. I am most excited to get the Jungle book. Very popular one! Good luck! The Chicken In Space book looks cute. It’s cute; my grandkids enjoyed it! It is such a cute book. My grandkids really like it! My 4 & 7 year old would love them all, but i’d probably be most excited to read The Jungle Book to them. One of my favorites! It seems that it has been the favorite pick! Wonderful classic story! And I think it will be enjoyed as much as the first one! Chicken in space my 6 and 4 year old would love it. It is a fun book! My grandkids enjoyed it! My almost 3 year old grandson would just love the There’s A Giraffe In My Soup book. Looks so cute! It is a cute book! My grandkids love it and I think your grandson would too! There’s a Giraffe in My Soup looks so fun. I would love this book. Good choice! Very funny book! Looking forward to reading There’sa Giraffe in My Soup. It’s a cute, funny book; I think you’ll like it! There’s a giraffe in my soup sounds really cute and fun. It seems to be the favorite! My grandchildren really like it! I think my grandson would love There’s a Giraffe in my Soup. I think that has been the favorite over all! Very funny book! One of my favorites too; I also love the animated Disney movie! The jungle book would be great to read. There’s a Giraffe in my Soup looks like it would be a fun read!